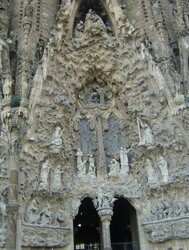 La Sagrada Familia can be found in Barcelona, in Catalonia in Spain and is renowned as Antoni Gaudi's masterpiece. Although thought of as a cathedral, it is in fact, a basilica - the cathedral in Barcelona is the Cathedral of Santa Eulalia. Gaudi was handed the project in 1884, but only after the founding association and the original choice of architect Francesc del Villar had irreconcilable disagreements with those behind the project. Gaudi went back to the drawing board and came back with a completely new design. He worked on the project for more than 40 years and during the last 15 years of his life, he devoted his entire efforts to it. As the building began to take shape, and reach further and further into the sky, the building began to take on a much talked about fantastical shape and the now world famous four spike shaped towers were crowned with geometrically shaped tops that were most likely influenced by the Cubist movement. The complicated decorations covering the basilica are rooted firmly with Art Nouveau styles. Unfortunately, in 1926, before La Sagrada Familia could be completed, Antoni Gaudi died. The iconic towers were originally intended to be three times higher than they were. At this time, the Spanish Civil War broke out and parts of the unfinished basilica and Gaudi's models and workshop were destroyed. No plans were left for the completion of the building and since then, work has continued on it with a variety of different architects, including Francesc Quintana and Lluis Gari. Famous sculptors such as J. Busquets and the controversial Josep Subirachs have work decorating the facades. Work has continued on La Sagrada Familia with the original plans being reconstructed from historical notes and adapting it to modern times. As Gaudi intended, every part of the basilica's design is rich with Christian symbolism. He wanted the church to be "the last great sanctuary of Christendom". In all, there will be 18 of the striking towers, representing in ascending order of height, the 12 Apostles, the four Evangelists, the Virgin Mary, and tallest of all - Jesus Christ. The four Evangelists towers will be topped with their traditional symbols, an angel, a bull an eagle and a lion - representing St Luke, St Matthew, St Mark and St John accordingly. The tallest tower will be surmounted by a huge cross. 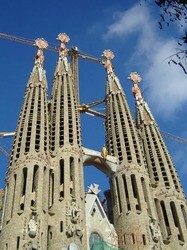 There will be three grand facades - the Nativity, the Passion and the unfinished Glory façade. The Passion façade includes strikingly emaciated figures of Christ being whipped and crucified and the doors on this façade reproduce words from the Bible in various languages, including Catalan, and the Glory façade is to be decorated with words from the Apostle's Creed. La Sagrada Familia was the most popular tourist attraction in the whole of Spain in 2004 with 2.26 million people visiting the unfinished building. It is hoped that, with the advent of quicker building technology than in the 1900's when La Sagrada Familia was started, it will be finished in 2026 - the centenary of Gaudi's death.